Do you want to be happy? Of course We all want to be peaceful, purposeful, and experience authentic, lasting joy. The Sky is Green and the Grass is Blue (http: //www.greenskyandbluegrass.com), offers fresh, fun, and surprising ways to live in lasting happiness. All ages will enjoy learning how to transform ANYTHING bad into a diamond you LOVE. Ready to receive a powerful, and effective mind vitamin to be happy? These pages were written for you "Deb Scott's "The Sky is Green and the Grass is Blue" provides a quirky, upbeat path to transforming your life. Whether you're a creative spirit or a businessperson, "The Sky is Green" offers insights into happiness from which all can benefit." Fern Reiss, director, The International Association of Writers, Speakers, and Experts, http: //www.AssociationofWriters.com "If you want to meet the most powerful and amazing person you will ever know, let Deborah Scott introduce you to YOU Within the pages of this book Deborah offers her first hand advice to gently and effectively guide you, including easy exercises which can assist you, in turning your challenges into celebrations." Sumner M. Davenport; Results Coach, Bounce-Back Expert; Best Selling Author; The "G" spot, The ecstasy of life through GRATITUDE. 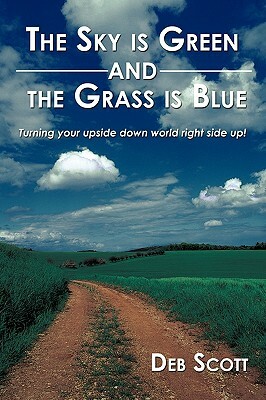 http: //www.SumnerDavenport.com "The Sky is Green and the Grass is Blue is the perfect gift for anyone in your life who is suffering and looking for resources to create happiness. Deb Scott takes readers on an inspiring journey through many self-help tools available today, including some surprising ideas on where you can find the most happiness." Lisa Tener; Book Writing Coach, Speaker, Published Author; http: //www.how-to-write-a-book.com.